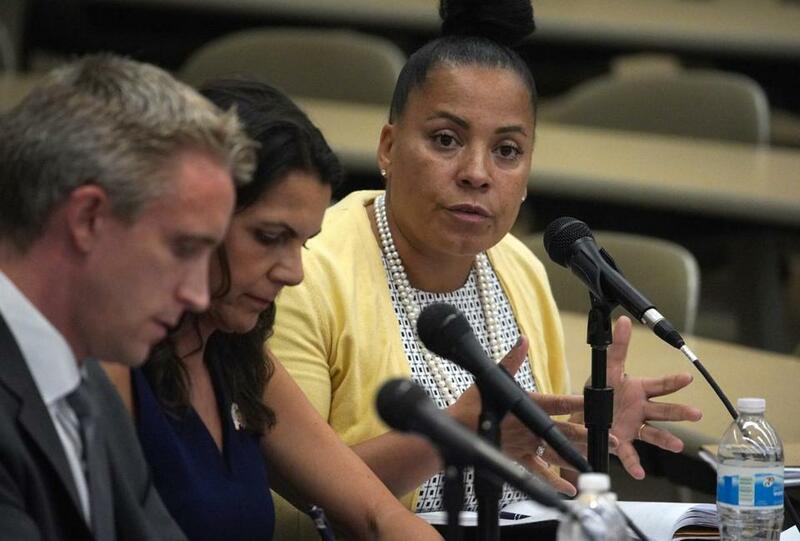 Rachael Rollins during a Suffolk County DA debate, hosted by the Massachusetts Fraternal Order of Police at the New England School of Law in Boston in August. She has gotten a shout-out from Barack Obama and has compared notes with Larry Krasner, the civil rights lawyer who last year rode a liberal wave to become Philadelphia’s district attorney. Since becoming the first black woman to win the Democratic nomination for Suffolk district attorney, Rachael Rollins has received national attention for her breakthrough victory, seen widely as a symbol of a new era of criminal justice reform. But locally, one of Rollins’s major campaign proposals has raised skepticism and even alarm in legal and law enforcement circles. Specifically, her plan to forgo prosecution of 15 offenses, ranging from trespassing to drug possession with intent to distribute, has drawn criticism from police and even some criminal defense attorneys. The Boston police union and retailers have decried the idea of dismissing charges such as resisting arrest and shoplifting before offenders are arraigned in court. In an interview with the Globe, Rollins said the list of offenses she proposed during her campaign was “aspirational” and meant to codify policy shifts that have taken hold nationally and are already practiced by prosecutors in Suffolk County, where the district attorney’s office says the incarceration rate has fallen 40 percent in the past five years. Many of the crimes on the list, including trespassing, shoplifting, and drug possession, typically lead to probation, rather than jail time, even if a defendant is charged multiple times, prosecutors and defense attorneys agree. Under Rollins’s plan, the offenses would be treated as civil infractions or dismissed outright. Declining to prosecute less serious crimes, an about-face from decades of tough-on-crime policies, would help break a cycle of incarceration that falls heavily on minorities, proponents say. Rollins said she has met with outgoing Suffolk District Attorney Daniel Conley to discuss her approach and is eager to meet with Boston Police Commissioner William Gross to hear his thoughts. Conley declined to comment. A spokesman for Gross said he wants to meet with Rollins before commenting. Rollins unveiled the list of offenses she would not prosecute weeks before she won the Sept. 4 primary. But since she emerged from a five-candidate field to become the clear favorite to win election in November, her proposals have been receiving closer scrutiny. “I think a lot of people assumed a different outcome and are now scrambling to say who is this person and what does she stand for,” Rollins said. In a result that stunned political observers. Rollins easily defeated Greg Henning, a longtime prosecutor who had the backing of police. She received 40 percent of the vote. She now faces Michael Maloney, a Brockton defense attorney who’s running as an independent. For Rollins, 47, the task is to persuade skeptics, including law enforcement officials she will have to work closely with, that her plan will reduce incarceration rates without causing an uptick in crime. On Wednesday, Rollins met with Michael F. Leary, president of the Boston Police Patrolmen’s Association, and two other officials at the union’s Dorchester office. Leary said Rollins listened attentively to their concerns about her proposal over bagels and coffee. Leary said he worries the opioid crisis would worsen if arrested drug dealers were released with no charges or court oversight. “If you go down Melnea Cass [Boulevard] and Mass. Ave., it’s a nightmare,” he said, referring to two Boston streets where people struggling with addiction often congregate. Ryan Kearney, general counsel of the Retailers Association of Massachusetts, said US retailers lose about $46 billion annually to shoplifters, which leads to higher prices for consumers and less tax revenue for states. “It isn’t a victimless crime,” he said. Rollins said she came up with the list of crimes she wouldn’t prosecute after meeting with prosecutors, defense attorneys, and retired judges to learn what kinds of cases were clogging up the court system. She said her goal is to free prosecutors from pursuing charges against low-level offenders so they can have more time to focus on violent crimes. Lesser crimes could still be prosecuted in “exceptional circumstances” after the line prosecutor has sought permission from a supervisor, according to a description she posted on her campaign website. “I think what’s getting lost is what I really want to focus on are the violent individuals and offenses that represent a danger to our community,” Rollins said. Her plan has also sparked debate in the legal and law enforcement communities over whether it represents a substantial departure from prosecutorial norms or simply advances an ongoing trend in criminal justice. Zachary Lown, a criminal defense attorney who practices in Roxbury and Dorchester, said prosecutors in those courts already move to divert those charged with drug possession and petty crimes into treatment or alternative programs. Dismissing cases outright would help defendants avoid the stigma of a criminal record, Lown said. “It’s impossible to get a job with a criminal record . . . or get an apartment or a place to live. It’s a moral issue,” Lown said. Christina Miller, a former Suffolk prosecutor who was chief of district courts for a decade, said that even if a defendant receives only a sentence of probation, the threat that further offenses could lead to jail time is a powerful incentive that comes only through prosecution. “The threat is what motivates somebody to comply, and there is the potential that without that, what is the incentive?” said Miller, now an assistant clinical professor at Suffolk University Law School.